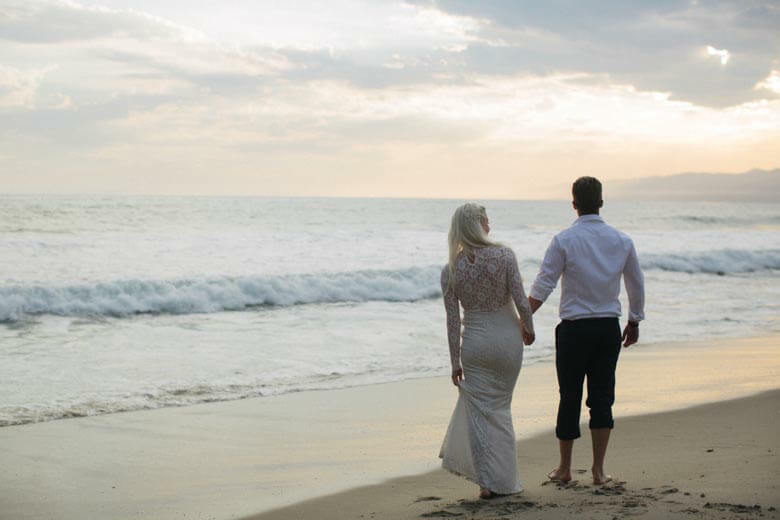 With the golden sand of California’s beaches and the blue-green tides of the Pacific Ocean, there are few places more perfect than Santa Monica and its waterfront for a whimsical honeymoon. After all, there are many stunning views to be seen in Southern California. 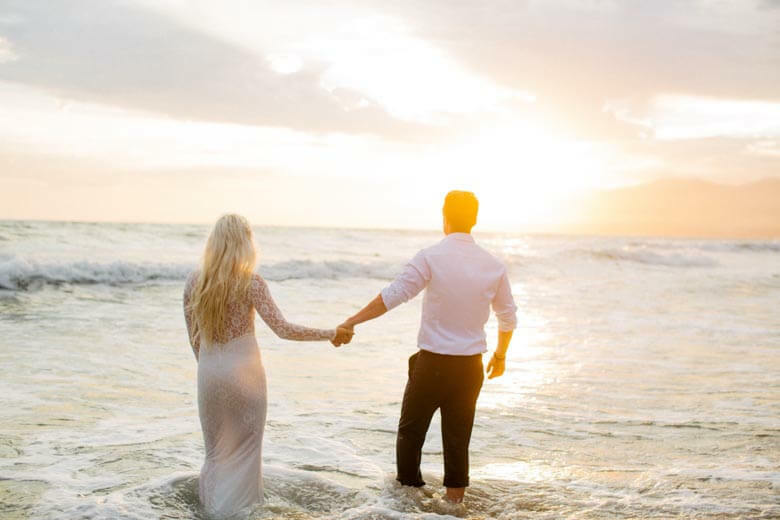 Our vacation photographer Sabrina was elated to capture the road trip of Cassandra and her husband as they walked in the afternoon light, played on the waterfront and frolicked in the surf as the sun set among the lapping tide of the horizon. 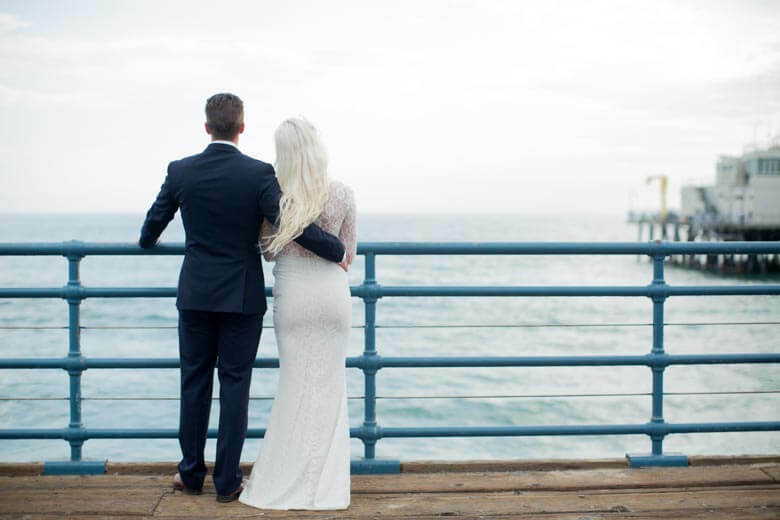 To mark their marriage, the happy couple took the time for a stop at the Santa Monica pier, dressing up in their wedding best to seize the day and have a keepsake of their road adventure. When it comes to celebrating the timelessness of love, there are few locations more stunning than the historic Santa Monica pier, full of shops, fishermen throwing out a line and the wooden boards of the dock underfoot. towels to enjoy the beautiful ocean view. As if to mirror the spirit of Cassandra and her new husband’s love, Sabrina caught them in a moment of solitude and adoration. They smiled at each other with the glittering sea in the background and the Santa Monica Mountains in the distance. It may be love and a sense of commitment that drew Cassandra and her husband together, but the road trip was an occasion for fun. To indulge in the true spirit of California, the newlyweds found a swing set on the sand below the pier. Past the hustle and bustle of the boardwalk and the famed Ferris wheel, they sat among rope swings and uneven bars. Our talented photographer caught the couple as they leaned in for a kiss on the swings. They clasped hands as if to hold still a smile and a place along the beach that would not soon be forgotten. After the swings and exploring the posts beneath the pier, the couple dug into the tawny sand and stared up up up into the sky, enjoying the moment and an idyllic afternoon on one of California’s most beautiful beaches. Few things are more magical and romantic than a sunset that can be seen from the beach. It was no different for these photos as the newlyweds played in the surf while the sun began to set. As Cassandra and her husband ran happily through the tides, couple photographer Sabrina caught the orange and pink horizon in the background, with the pacific tide rolling swiftly across the sand.